It doesn't seem like it's been 20 weeks that I've been spending time watching classic Doctor Who episodes. But I'm up to Season 20, and, well, you do the math. Season 20 was a treat. The actual season consisted of six serials, made up of 22 episodes. BBC was still broadcasting the show twice a week (like they used to do Batman in the U.S. on ABC back in 1966), so the season only ran from early January to mid-March 1983. But, late in the year, another episode aired. It was actually not part of Season 20 nor Season 21. 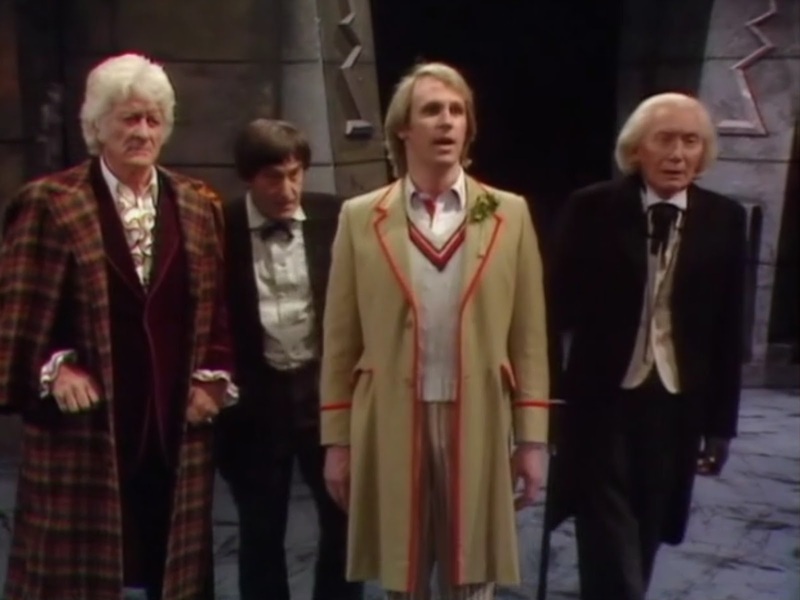 It was a 90-minute special called The Five Doctors. More about that in a bit. The season began with the return of Tegan, who had been abandoned by The Doctor at the end of the previous season. In Arc of Infinity (4 episodes), Tegan was brought to The Doctor by Omega, who was making a return appearance. Other past villains returned in the show's 20th season, including the Mara (who appeared in Season 19's Kinda), the Black Guardian (who first appeared in Season 16's The Armageddon Factor), and The Master (who has been battling The Doctor since Season Eight). Villains weren't the only characters to reappear. Brigadier (retired) Alistair Gordon Lethbridge-Stewart appeared in Mawdryn Undead (4 episodes) and helped battle the Black Guardian. Mawdryn Undead featured the story advancing in two different time lines jumping from 1977 to 1983. I think they took the TARDIS into the future and stole the two time lines idea from Lost. Mawdryn Undead also features The Doctor explicitly stating that he can only regenerate 12 times, which means he can have 13 lives. He also says he has regenerated four times already. Remember at the end of Season Six, when the Time Lords forced The Doctor (2.0, Patrick Troughton) to change his appearance (3.0, Jon Pertwee)? Well, I had wondered if that truly was a regeneration. Well, it was. It cost The Doctor a life. Which means they executed him. They ended his second life, and brought on his third. Pretty severe stuff. That serial also introduced Vislor Turlough as a new companion of The Doctor. Initially, he was working with the Black Guardian, although reluctantly. He became one of The Doctor's companions at the end of the serial, although he continued to work with the Black Guardian during the next two serials. At the end of Enlightenment (4 episodes), the finale of the Black Guardian trilogy, he actually helped defeat the Black Guardian, and was freed to travel with The Doctor. Nyssa (Sarah Sutton) left the series at the end of Terminus (4 episodes), the middle serial of the Black Guardian trilogy, in order to work with with the disease colony that was a part of the main story. Behind the scenes, the character of Nyssa wasn't owned by the BBC, and they had to pay royalties when the character appeared. They had tried to write the character out several times before, in order to not have to pay the royalties, but Peter Davison intervened, because he liked the character so much. I've found nothing to indicate that Sarah Sutton was unhappy with her role. The highlight of the season was actually many months after the end of the season. Since the season ended in the middle of March of 1983, it was over eight months until the show's 20th anniversary in November. A 90-minute special, The Five Doctors, was broadcast. Interesting thing, though, it aired on the show's 20th anniversary, 23 November, 1963, on PBS in the United States. In the United Kingdom, it aired on 25 November on BBC. One day, I shall come back — yes, I shall come back. Until then, there must be no regrets, no tears, no anxieties. Just go forward in all your beliefs, and prove to me that I am not mistaken in mine. 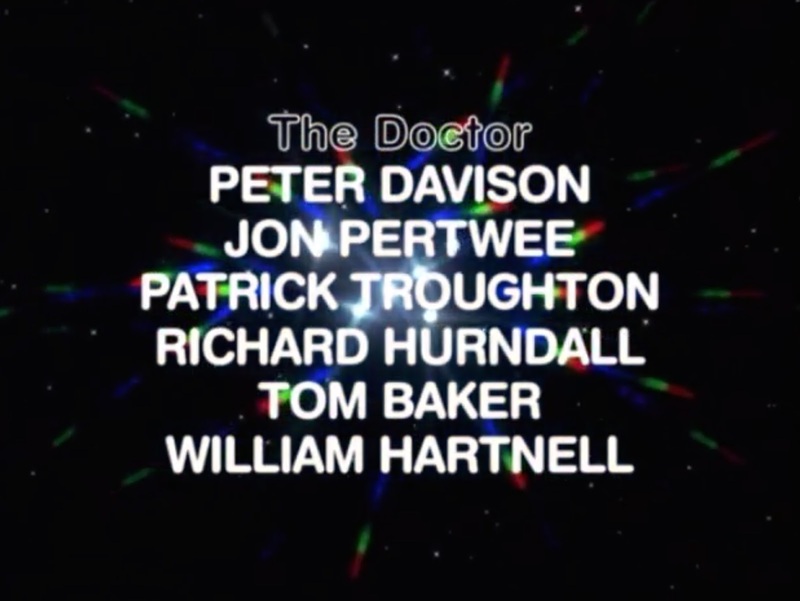 During the actual episode, the role of The Doctor 1.0 was played by Richard Hurndall in his only appearance in the series. Hurndall died around five months after The Five Doctors aired. Hurndall did an excellent job as The Doctor, I thought. His portrayal was reminiscent of Hartnell's appearances as The Doctor, plus the "Dandy and a Clown" attitude from Hartnell's last appearance in Season Ten's The Three Doctors. The special also featured another return appearances of Brigadier Lethbridge-Stewart, as well as appearances by Sarah Jane Smith and Susan, both of whom were kidnapped along with The Doctor, The Doctor, and The Doctor -- but not The Doctor. The previous four incarnations were all kidnapped by [SPOILER ALERT] Barusa, president of the Time Lords, who was seeking immorality. The Doctor (4.0, Tom Baker) was trapped in a time eddy, or something, since Tom Baker refused to appear in the episode. They accomplished his kidnapping by using scenes from the unaired and uncompleted serial Shada. The other incarnations were kidnapped by using scenes specifically filmed for the special. The kidnapping of the companions were all shown on-screen, with the exception of Susan's. Other previous companions also appeared in the special. Jamie McCrimmon (Frazer Hines), Zoe Heriot (Wendy Padbury), Liz Shaw (Caroline John), and Mike Yates (Richard Franklin) all appeared without their kidnapping being shown. In their cases, though, The Doctor realized they were not really there, but were images placed as obstacles to The Doctor's path. Susan, though, was actually there, though her kidnapping wasn't shown. The Cybermen and the Daleks also made brief appearances, but were not significantly involved in the plot, other than as minor obstacles to overcome. The Master also appeared, but as an attempted ally of The Doctor. The Time Lords sent him to the Death Zone to assist The Doctor. At the end, of course, he tried to defeat The Doctor. It was good to see The Doctor, The Doctor, and The Doctor in action again, and unfortunate that we didn't see much of The Doctor. But, they did help The Doctor defeat Barusa and save the day. 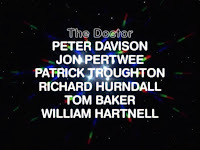 On to Season 21, and another Doctor. Which means the scenes of Tom Baker in "The Five Doctors" were "doctored."